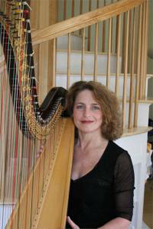 Elizabeth Morse, principal harpist of the Berkshire Symphony and Artist Associate in Harp at Williams College, has been active throughout New England as a soloist, recitalist, chamber musician and pedagogue. She is formerly principal harpist of the Rhode Island Philharmonic and assistant director of the Boston University Tanglewood Institute Harp Seminar. In 1999 she was a judge at the Schubert International Competition in Ovada, Italy and currently a judge of the Harvard Musical Association’s Foote Award. Ms. Morse is a graduate of Boston University School for the Arts where she studied with Lucile Lawrence. She was the recipient of the Oliver Ditson Fund Award, the Crescendo Club Scholarship, and the Arlington Symphony Concerto Competition. Further studies were at Boston University Tanglewood Institute and with Alice Chalifoux at the Salzedo Harp Colony. At the age of 17 she gave her Boston debut at Jordan Hall with Gunther Schuller conducting Mozart’s Concerto for Flute and Harp. At the 1973 Music Educators’ National Conference, representing the American Harp Society, she premiered the Concertino for Harp by Ernst von Dohnanyi. An advocate of contemporary music, she has premiered and commissioned works of dozens of composers including Peter Child, Augusta Read Thomas and Donald Crockett in concert with the new music groups such as Extension Works, Williams College Group for 20th Century Music, and Alea III. Ms Morse has played with the Boston Symphony, Boston Pops, John Williams and Friends at Ozawa Hall, The Pennsylvania Ballet, The Boston Chamber Music Society, Cantata Singers, and the Boston Conservatory Chamber Ensemble. Highlights include solo appearances in Italy, Argentina, the Colonial Symphony under the direction of Oscar Shumsky, the Goldovsky Summer Music Festival, MIT Chamber Players, the New England Philharmonic, and at a Boston Symphony Orchestrated Event; and recitals at Lincoln Center Library for the Performing Arts presented by the New York Musicians’ Club, the Gardner and Fogg Art Museums, the Museum of Fine Arts, Sanders Theater presented by the Peabody Mason Foundation, Harvard Musical Association and the Boston Public Library. She has been a guest on public radio’s Classics in the Morning, Here and Now, Morning Pro Musica, and Studio One with various ensembles including the Greylock Trio for flute, cello and harp. Ms. Morse has given master classes at Boston University’s School for the Arts and the Tanglewood Institute.